The SOS Children's Villages Association of Botswana was founded in 1980, 14 years after the country's independence. Against the background of a rapidly increasing number of AIDS orphans, the work of SOS Children's Villages became particularly important in Botswana. At present there are three SOS Children's Villages in Botswana, two SOS Youth Facilities, three SOS Kindergartens and two SOS Social Centres (family strengthening programs). SOS relies on the kindness and generosity of Canadians to be able to provide a home for the most vulnerable children of Botswana. Please help us ensure a loving home for every Botswana child. Sponsor a child in Botswana now. The high number of orphans in Botswana due to HIV/AIDS makes the work of our organisation particularly important. Since 2008, SOS Children's Villages has been operating SOS Family Strengthening Programs in order to help families to protect and care for their children. Strengthening family ties and enabling children who are at risk of losing parental care to grow up in a caring family environment has been one of our main goals. SOS Children's Villages is currently operating in three locations in Botswana where children are provided with day care, education and medical assistance. Children whose families cannot take care of them can find a loving home in one of the SOS families. Botswana's total population is roughly 2 million and its capital is Gaborone. Nearly forty years of uninterrupted multi-party democracy, constantly rising GDP levels and modern social welfare policies have transformed Botswana into a role model for many other African states. At around 7 per cent annual growth, the economy of Botswana is currently one of the fastest growing in the world. The country's most important economic resource is diamonds. The country is characterised by a fairly large middle-class-population, compared to most other African states. At 8.9 per cent of the GDP, Botswana's government is also spending more on education than most other countries in the region. Its GDP has been on the rise during the last two decades. Within only a few decades after Botswana became an independent nation, the country has managed to work its way up from the group of less developed countries (LDCs) to a middle income country. In spite of Botswana's impressive macroeconomic growth, rates of poverty and inequality remain persistently high. 23 per cent of Botswana's population still have to eke out a living on less than 1.25 US dollars a day. Undernourishment issues also conflict with the country's economic uptrend as 26 per cent of the people in Botswana struggle to cover the daily minimum calorie requirements. Access to decent sanitation facilities is generally good in urban areas but remains precarious in some rural parts of the country. The HIV/AIDS pandemic that affects Botswana remains the country's main health concern. At 24.8 per cent, the country has one of the highest HIV/AIDS prevalence rates in the entire world. Apart from the immense human suffering that AIDS is causing, the economic impact of the disease in Botswana is also considerable. HIV/AIDS generally hits adults in their most economically productive years. Due to increased mortality and chronic illness, the labour force in Botswana is constantly reduced, which in turn affects households and individual families. Because of HIV, life expectancy at birth has dropped noticeably in Botswana and most of Sub-Saharan Africa over the past decades. Nonetheless, the country is making progress: Botswana's Prevention of Mother to Child HIV Transmission (PMCT) programs have been praised as the most successful in Africa. 96% of babies born under the program are HIV negative and Botswana is the first country to reach nearly 80 per cent coverage for such services. The government has shown a high level of dedication in terms of fighting HIV. HIV treatment programs in Botswana are highly advanced and anti-retroviral drugs are readily available. According to UNICEF estimates, there are around 130,000 orphans living in Botswana. 93,000 of them have been orphaned due to AIDS. The HIV/AIDS pandemic can therefore be cited as the main reason why children in Botswana grow up without parental care. With their parents becoming ill, children are automatically taking on more responsibility within the family. When their parents die, many of them end up heading households. The socio-economic vulnerability of child-headed households is high. They often have to work in order to earn an income, making it nearly impossible for many of them to attend school - just another visible effect of the disease. Many orphaned children who have lost their parents to AIDS struggle to afford tuition fees and other school-related expenses. This is where a vicious circle starts: education is the key to avoid a rampant spread of HIV. Without education, young adults are more likely to contract the disease due to a lack of knowledge on how to prevent an infection in the first place. 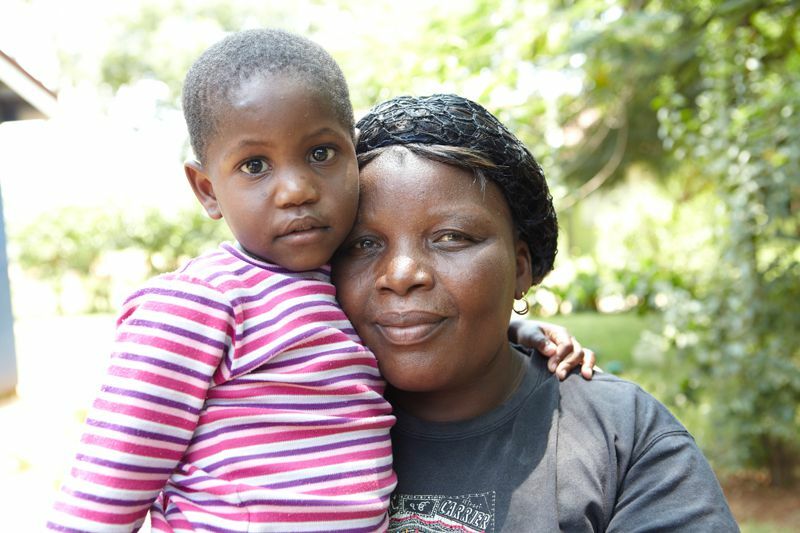 In Botswana, 16,000 children aged 0-14 are living with HIV. Because of strong social stigma and stereotypes, coming to terms with their HIV status is sometimes very difficult for the young population in Botswana. Nevertheless, there have been substantial improvements in the field of public health: both the country's infant mortality rate and its under-five-mortality-rate have dropped noticeably over the past 12 years. The under-five-mortality rate per 1,000 births has more than halved from 89 in 2003 to 40 in 2011.